This entry was posted in Racing on November 23, 2008 by Steve Tilford. 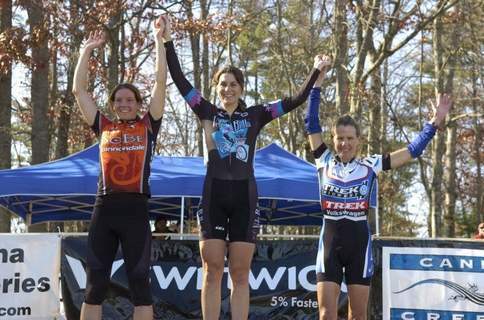 I just got back from the North Carolina Gran Prix in Hendersonville, NC. Catherine Walberg and myself flew down to Greenville, SC Friday and back on Monday. We did the same races last year. It was super fun and professionally promoted. Tim and the guys there know how to design and promote an excellent event. How about the refunding of entries to every Elite rider that pre-registered. That is something unheard of nowadays in cycling. It is so expensive to travel around the country collecting UCI points. They understand the situation and are into the sport, not the $$$. Anyway, the course was excellent. Dry, fast, and technical at speed. Saturday it was pretty chilly. In the upper 30’s, during the race. The Elite women’s race was right before the men’s. I have a hard time not watching the race and warming up properly. But, alot of the enjoyment I get out of cycling is spectating, so it is what it is. Catherine got knocked down almost immediately after entering the grass. Then again at the barriers and once more again on the first lap. That is a recipe for disaster in cyclocross. She played catchup the whole 40 minutes and ended up finishing 9th. 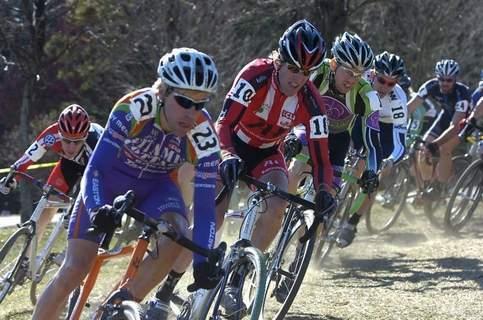 She has points in 5 C2 cyclocross races, so any result in a C2 will make that a throwout. In the men’s race, I got a horrible start even though I was in the first row. Jeremiah Bishop and I were talking when they blew the whistle. I was 15th or so going into the grass. It took me almost two laps to get to the front of a line of 12 guys. I attacked on a wooded climb and opened up a small gap. Jeremiah chased and caught me a half a lap later. My rear wheel had been washing out on some of the tighter corners. Right after the pit I realized that my tire was flat. There were only 6 guys left in the front group after the attacks. 4 or 5 more guys passed me after riding half a lap on a flat and half a lap on a borrowed spare bike. I was out of the UCI points. I got back to 10th pretty easily. I saw Will Black riding in a group of 3 up ahead. 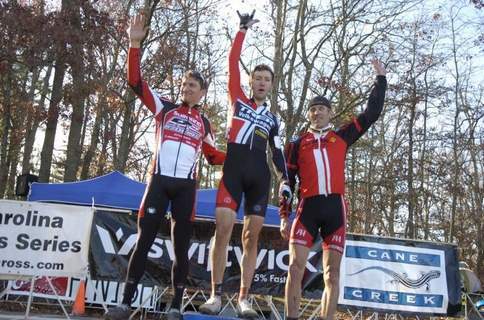 Will had told me he couldn’t get any UCI points because he was going to Master’s Worlds in February. They dropped one guy and on the last lap Will sat up to get 11th like a good boy. When I caught up to him, he took a huge pull and got me back up to the guy in 7th. I dropped him on the last climb and that is where I ended up. Jeremiah Bishop outsprinted Russell Stevenson after Jonathan Baker pulled his foot out in the sprint. Sunday I knew I was going to be going pretty well. Same course, warmer weather. Catherine’s race went much better. She got a excellent start, never rode too far back in the front group and sprinted for first. Even though she finished 3rd, it was a redemption somewhat. I got a much better start. I got into the grass in 2nd and just sat there. 3/4 of the way into the first lap I took off again. I felt better and didn’t want to mess around with so many guys. Russell Stevenson came after me a little later and caught me. Jeremiah Bishop let us get up the road a bit and then bridged. We rode together pretty much for the next half hour. I felt pretty good. I never got too winded. Bishop fell during one attack. Russell ramped it up for a while. I just sat. We kind of started messing around too much for my liking after Jeremiah got back on. I took a 1/2 lap pull and put in a few efforts. With two to go, on the pavement, I pulled over to swing off and Bishop jumped. Russell and I just watched him ride away. I felt good. I blew it. We didn’t do hardly anything to even fake chasing him. With a half a lap to go, he was completely out of reach. Russell and I jumped each other a few times, got a little tangled up a couple times and ended up coming to the last 100 meter pavement stretch together. 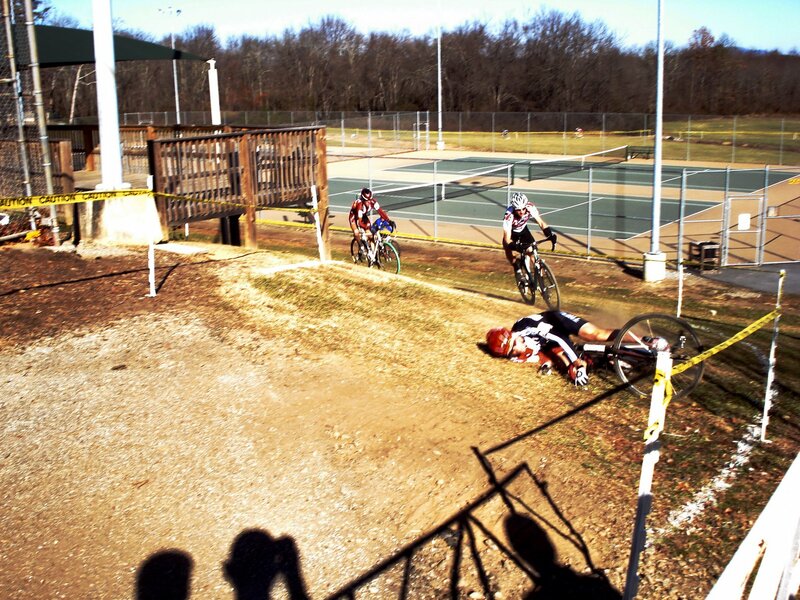 I was in the lead, but took the last U-turn wide and he smeared me in the sprint. Anyway, I was going way better than I have been. Jingle Cross in Iowa City this weekend. Todd and Troy Wells, Tim Johnson and a few more good guys are coming. It should be a good test a couple weeks before Nationals in KC. Jeremiah Bishop on the ground and then back on quickly.